William J. Ridenour, James C. Cherry, and Gary R. Shook. When you think of cutting-edge mobile banking, does your local bank come to mind? Too often the answer is no, says Jim Cherry, the Richmond-based CEO of Charlotte-based Park Sterling Bank. 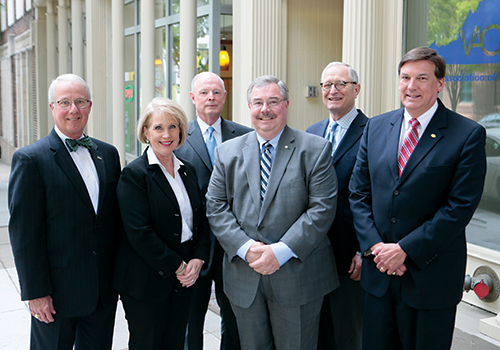 The personal touch of community banks is still a core value. Billy Beale, president and CEO of Union Bankshares Corp. in Richmond, says customers like dealing with the familiar faces they know at a community bank. “The person that a client had 10 years ago is probably the same person today and likely the one they’ll have five years from now,” he says. And when they had a choice, some community banks picked up business. Bob Aston, chairman and CEO of TowneBank in Portsmouth, says the retreat of larger banks from some portfolios “actually made some of those years during the downturn some of our best years.” Big banks may have hurt themselves, he says, because their good customers would just go to another lender, leaving some banks “stuck with those who couldn’t pay. Those dynamics have given way, though, to the changes that mobile banking is having on big and small banks. Those changes suggest that the personal touch that community banks provide isn’t enough. Bank of America, for example, has been selling off hundreds of branches as it turns toward a mobile-banking market. Cherry sees that kind of move by bigger banks as evidence that branch-based banking isn’t where the growth is. Before its recent merger with Glenn Allen-based First Capital Bancorp, Cherry says, Park Sterling tried an experiment. It announced a money market account with a generous 1.36 annual percentage yield. Some said the bank was paying too much, but Cherry notes the offer attracted about $60 million in deposits in just a few months without adding any new bank branches. He says one of his bank branches typically has about $35 million in deposits, adding that a new branch requires four to five years to reach that level. What’s more, Cherry says, mobile banking is filling in the gap for customers in rural areas. They might have seen their local branch close and have to travel a long way to reach the closest one. “The truth of the matter is they’re being served better,” he says. Mobile banking can go anywhere customers are. Recently a customer who spends part of the year in Naples, Fla., asked whether there was a branch there. Cherry said use your smartphone. What about cash withdrawals? Use any ATM and we’ll pay the interchange fee, Cherry told him. This is what community banks need to do to capture customers who will gravitate toward mobile banking. “I think the key is letting people know we’re part of that,” Cherry says. Banks of every size need customers to trust them, and keeping up with cybersecurity is a big deal. Bill Ridenour, president and CAO for John Marshall Bank in Reston, says it recently completed a conversion to a new security system “and it was a big investment … it was hundreds and hundreds of thousands of dollars.” The process took more than a year, with everything from making sure vendors are compliant with cybersecurity protocol to training staff and educating customers. Still, with HomeTown Bank, says her bank even sets up small tests for its board members to make sure they know how to avoid exposing the bank to hackers who come in through emails or web links. Banks may have it a bit tougher than other businesses in that they’re handling so many money transactions. Gary Shook, president and CEO of Middleburg Bank in Middleburg, says customers still want the best of both worlds. “They want to press the button and say, ‘Go,’ and we’re trying to protect them in the process,” he says. With interest rates so low — in mid-June the Federal Reserve held steady on its benchmark interest rate — banks of every size are chasing the growth and profit they can find. The disruptive technology changing the industry nowadays is making that possible, but it also brings a new set of challenges.